There was a fake eyelash on the floor. Adwa noticed. She picks up on the small things. The things you hear, the actions you see, the energies you receive, all of these things have an impact on you. Whether you notice it or not. Your thoughts. The voices in your head, they’re not always your own. They say you’re who you surround yourself with. I agree. Take a look at the people you spend most of your time with. Notice how you feel after being around them. Do you feel dead and heavy afterward? What are they adding to your life? Evaluate your conversations with others. How did they make you feel? What were they about? There’s a quote from Eleanor Roosevelt that I’ve heard when I was a little girl and has stuck with me ever since. Sometimes we talk to avoid the awkward silence, to pass time, and sometimes to vent and complain. Pay attention to what you hear and to what you say. It’s better to stay silent than to say something harmful. I have been really focused on the quality of my conversations these past two years. And because of this intention to be more aware of my dialogues, the minute the conversation becomes about other people, I start to get this unpleasant, almost sick feeling. I switch the conversation, but that doesn’t always work. Some people insist on gossiping until they let it all out of their chest. In that situation, I just stay quiet. Sometimes my silence makes them notice the simplicity of their problems. A good friend of mine told me this quote and she was encouraging me to be picky about the people I hang out with (Thank you if you’re reading this!) Anyways, at first, I didn’t agree with the quote, as most people would. Because we are our own selves too. But when you think twice about it..
Those five people he’s talking about can, in fact, include you. Do you spend enough time with yourself? I mean just you. No phone, no laptop, not even a book. Just sit with yourself. No distractions. Be alone sometimes. It can do you good. I find the best way to connect is by spending time outside in nature. It has a unique quality. I can’t really point it down. But I know it’s vital. It fills your heart and makes you feel lighter instantly. The second you breathe in fresh air, suddenly everything is okay. I hear the birds, feel the cat hiding in the bushes, see the insects living in their own world under my shadow, the clouds moving above me. I never feel alone. I can see how everything is connected. 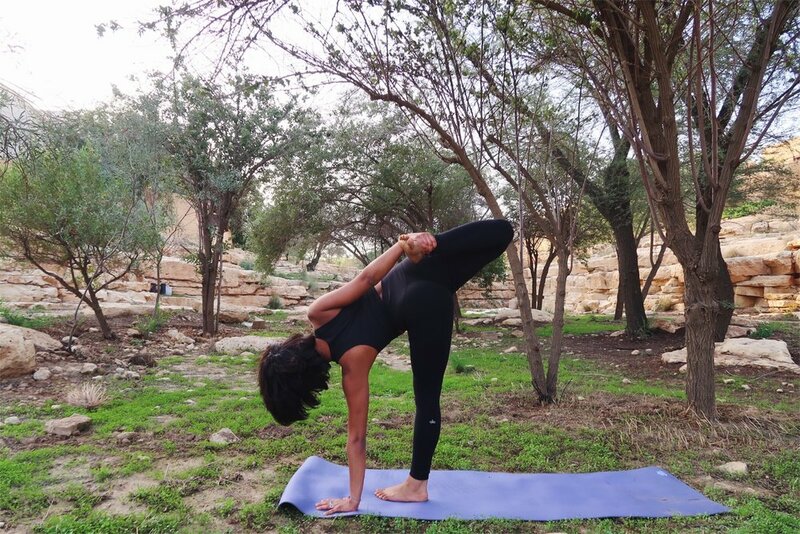 Right at sunrise, I left the house to go meet up with Adwa Bader for a morning hike, yoga, and a little picnic. We talked, discussed, shared our dreams, and fears. As both of us are bloggers and believers. We believe in ourselves and in our paths. Even when it doesn’t seem rational for others. Afterward, my head was rushing with ideas, sentences, in other words, I was inspired. I felt alive. Stay tuned for upcoming projects with @LightsandCharlie and check out her blog for a striking mix between philosophical intros and real fashion.